Weak, twiggy branches forming behind the pruning cuts that removed dead branch tips in 2007. The Easter freeze of 2007 caused serious damage to many species of landscape plants. Among the most seriously injured were various cultivars of Japanese maple. Given that the freeze was unprecedented, it was difficult to decide how to do corrective pruning of damaged trees based on previous experience. 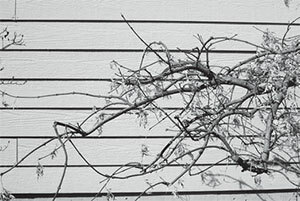 Most experts recommended restricting pruning of Japanese maples to removal of dead branches as they became apparent. Now that the damage has had a year to manifest itself, it may be possible to make some rational pruning decisions. March is a good time to begin the process. Many types of injury to Japanese maples became evident during the 2007 growing season. Death of new growth was immediate. Then, freezing injury to the bark led to die-back of branches and, in some cases, parts of main trunks. Exposure of remaining branches caused sun scald, often followed by infestation of damaged tissues by stem boring insects. 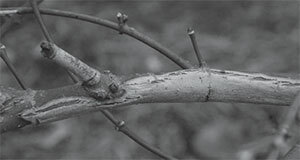 Some of the shoots arising from surviving stems grew weakly, indicating that the vascular tissues may not have been functioning normally even by late summer. Loss of foliage may have also affected the roots, since their supply of carbohydrates was greatly reduced. Many trees showed additional die-back over the summer, from the points where apparently dead tips were pruned off. At present, some trees have sunken areas in their bark (cankers) on main branches well below the tips, indicating possible invasion of damaged tissues by opportunistic fungal organisms. Some of these cankers may cause additional branch die-back. Do not remove all excess branches in one season. Concentrate on shoots that are vertical or growing back toward the center of the tree. Tip some branches to control their growth, but allow them to produce foliage to help the tree recover. While some Japanese maples in protected locations suffered minor damage, most of trees that I have observed in Missouri were seriously compromised by the Easter freeze. Although it may be possible to re-establish aesthetically appealing branching structures on many trees, this may take as long as ten years in some cases. 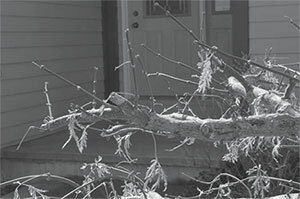 Seriously damaged trees may succumb to other, stress-induced problems before they are able to recover. In cases where 4 or 5 main branches survived, each with some viable lateral branches, there is a good chance that an aesthetically acceptable top can be regenerated within 5 years. Regardless of the outcome, a gardener who accepts the challenge of restoring a damaged tree will learn something about pruning. Stem canker caused by freeze injury. This may cause additional die-back in 2008. 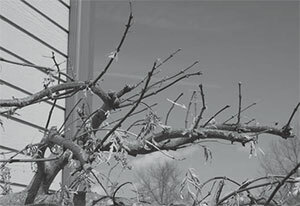 When pruning freeze-injured Japanese maples, self restraint will pay dividends. Most trees have produced many twiggy, tangled shoots from buds that developed below the branch die-back. This will eventually need to be thinned by 50 to 75 percent. However, avoid thinning shoots to the desired number all in one season. The foliage they produce will shade exposed branches and produce carbohydrates for stems and roots. Also, excessive pruning will lead to more uncontrolled growth, making pruning more complicated in following years. Thin out about 1/3 of the excess branches in 2008, concentrating on shoots that are growing vertically or toward the center of the tree. Never leave stubs. Cut branches back to their points of attachment with other branches or stems. Continue restrained thinning each spring for the next 3 to 5 years, paying close attention to the responses to cuts made the previous year. Tangled growth will need to be thinned gradually over the next several years. Do not use excessive nitrogen fertilizer. Applying more than one ounce of a fertilizer containing 20 percent soluble nitrogen to a tree with a branch spread of 3 feet may stimulate excessive shoot growth, making pruning more challenging. If a damaged tree has not been fertilized for several years, use a slow release fertilizer at a low rate to maintain reasonable vigor. Mulching and careful irrigation over the next several years to keep the root zone uniformly moist (not wet) may help pull damaged plants through.